You open your car door one day and there it is. That unmistakable smell. You are momentarily overpowered by it. Knocked over by the odor. The odor is something entirely out of this world…and not in a good way. The smell? The smell is unmistakable. It is the smell of too many fast food meals gobbled on the way to soccer practice. It is the aroma of a pair of sweaty sneakers and a balled up soccer jersey stowed under the seat. It is the scent of a wet swim towel that you are pretty sure you asked your teen to bring in to the house a WEEK ago. The smell you smell is very far from that New Car Smell when you drove your car off the lot. Remember that smell? It was the smell of clean laundry. Newness. That New Car Smell is well and truly gone. Now the smell is more of an Ew Car Smell. This yucky smell lingers in your car even with the windows rolled down or the AC on full blast. What you need is a way to get rid of the Ew Car Smell. 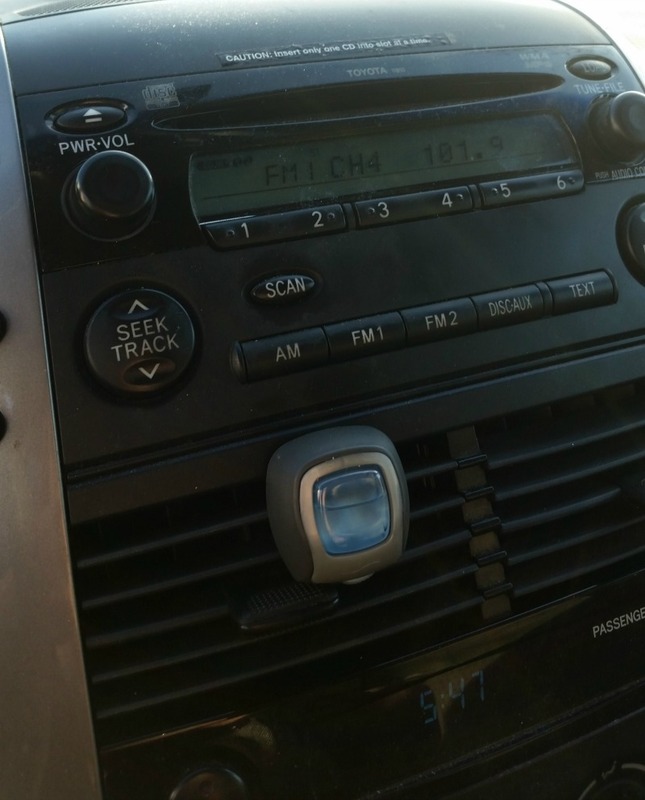 What you need is Febreze Car Vent Clips…STAT. After a bleak, midwinter of driving a school car pool daily, dropping kids off at soccer and swim team practice every day, and endless rushed meals on-the-go, my minivan is in dire need of a major car detailing. But who has the time to leave their car for hours and hours for someone to detail/clean it? I’m on-the-go all the time. I’m a road warrior dropping kids at school, running errands, and driving carpool with little time for car detailing. Not to mention that car detailing costs big bucks. The next best thing to a car detailing is the Febreze Car Vent Clips. I clipped Febreze Car Vent Clips on my side air vent. I detected a very pleasant scent right away. A mix of clean laundry and spring. I used the Linen & Sky scented Febreze Car Vent Clips. Febreze Car Vent Clips changed the Ew Car Smell in my minivan to a very pleasant New Car Smell. 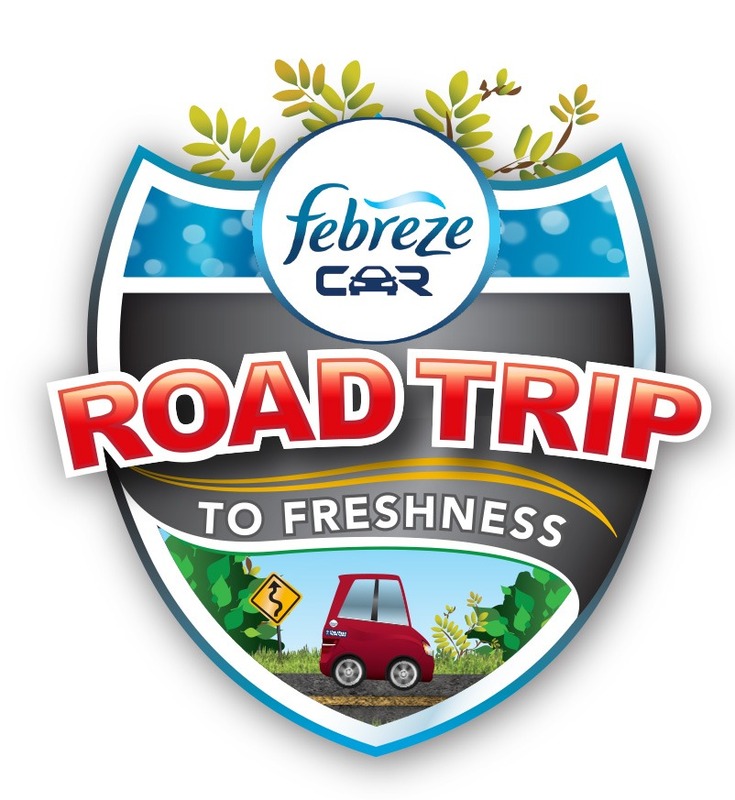 Febreze Car Vent Clips come in the following scents: Gain Original, Gain Island Fresh, Hawaiian Aloha, Midnight Storm, Line & Sky, Seaside Air, Meadows & Rain, Heavy Duty, Smoke Odor Eliminator, AND even New Car Scent(!) Air Fresheners. 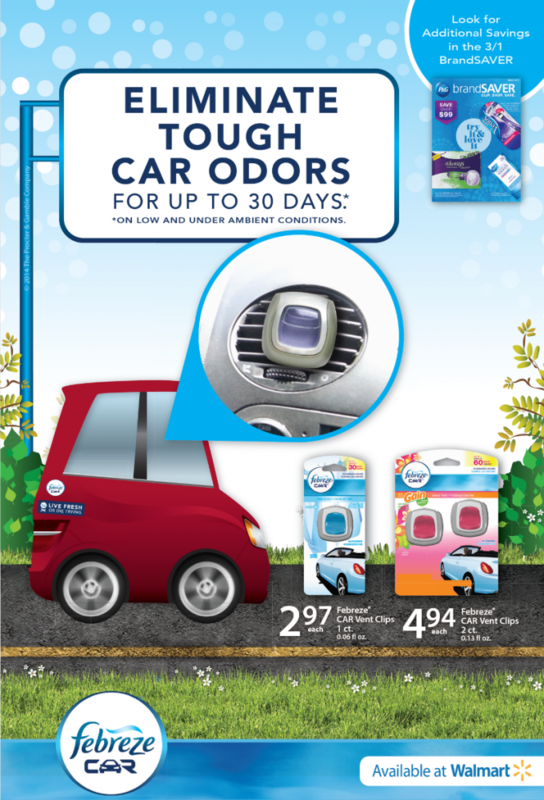 Febreze Car Vent Clips last up to 30 days. Pick up a Febreze Car Vent Clip from Walmart to take freshness on the go with you and your family. Snap Febreze Vent Clips on to your car to bring the comfort of a fresh-smelling home on the road with you and your family. Find Febreze Vent Car Clips at your local Walmart. 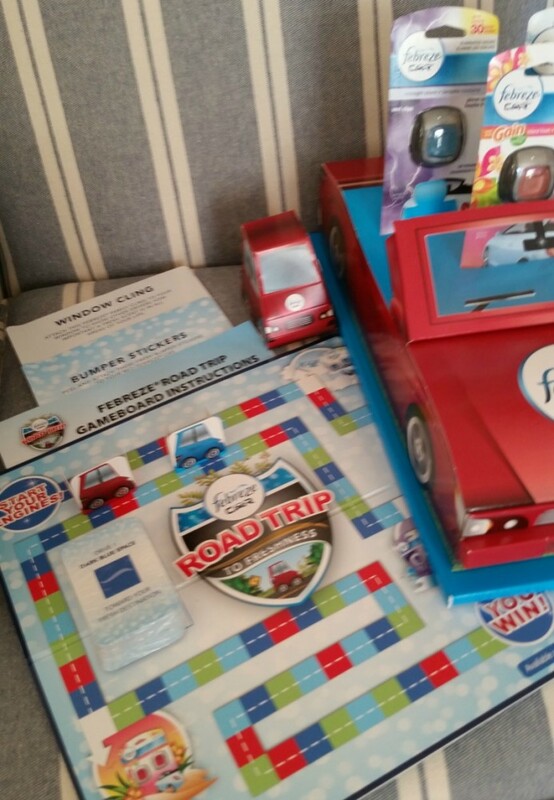 Visit Febreze.com for offers and coupons on all your favorite Febreze products! Want To Win a $25 Walmart Gift Card? Giveaway is open to U.S. residents only. Giveaway ends March 20, 2015, 12 a.m.
Disclosure: This is a sponsored post for SheSpeaks/Febreze. Opinions expressed in this post are my own. My husband could use a car care basket. I found some wet towels from the pool in the trunk and they stunk up the whole car. my car has never smelled of anything but dust or musty smelling. One time I accidentally left raw chicken in the trunk of my car. It started to smell really bad in my car, and I oould not figure out what it was. Finally I checked the whole car out and found the rotting chicken! It smelled awful. The smelliest item I’ve found in my car was my husband’s towel he used while he played tennis. Ive found old lunches and a dirty diaper before. A leftover sandwich that had been sitting in the hot sun all weekend. Old food under the seat. Forgotten and spilled yogurt and milk mess kids made in the car were the worst. Usually old snack cakes…so gross. The smelliest item I’ve found in my car was leftover fries left in my car for a week in the hot sun. The Smelliest Item I’ve Found In My Car Was A Container Of Tacos My Husband Left. I found my son’s shoes in my vehicle. Not the freshest thing! A dirty diaper that got left after a diaper change of my grandson and it got pushed under the seat. The smelliest item/s was a seashells my kids brought item from the beach. The smellist thing I found in my car was when my husband forgot to take the worms out of the car after he went fishing..yuk. The smelliest thing I ever found was a pack of rotten meat that someone had left in the truck when they didn’t get all the groceries in. It was not pleasant. One of the kids left a half eaten hot dog in the car. When discovered – oh phew! An old bottle of milk that had turned rancid. My kids sweaty sporting equipment is the smelliest thing I find in my car! Wet clothes and towels from the beach. Oh after a family get together, I gave my sister a ride home. Her banana pudding dessert slipped under the seat and she didnt notice. A couple days later I got in the car to go somewhere…oh boy did it stink!! Oh one when we adopted two labs puppies that had some anxiety issues, one pooped in the can on the way home. Felt so bad for him…but his doing so much better. A cup with milk that turned rotten. So gross! The smelliest item I have found was an old french fry that had fallen under the seat. Gross. The smelliest item was left over food I forgot to throw away. Once I threw some rained-on books into the trunk of my car; by the time I remembered them the mildew smell was overwhelming! I forgot to take gym clothes out of my car!